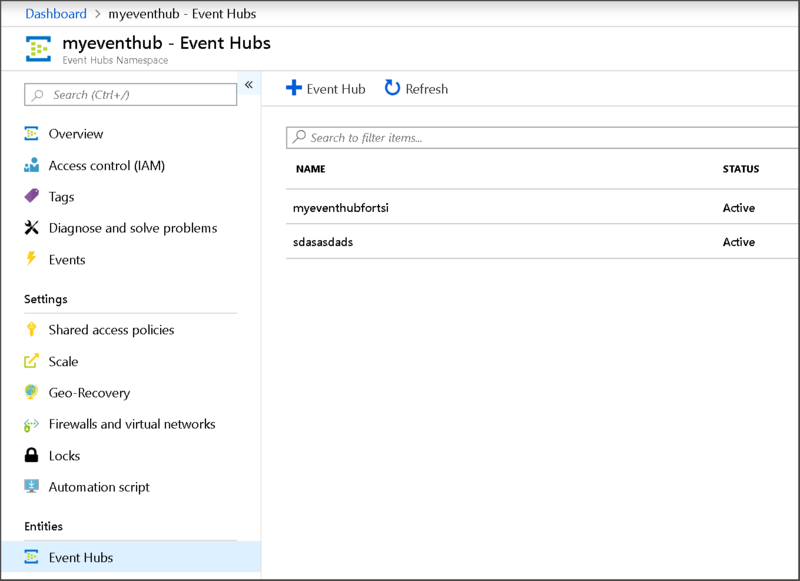 This article explains how to create and configure an event hub in Azure Event Hubs, and then run a sample application to push events. 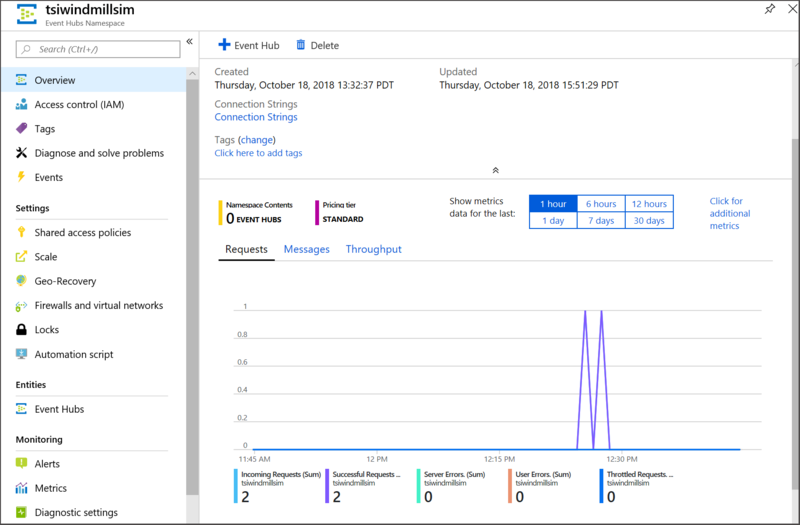 If you have an existing event hub that has events in JSON format, skip this tutorial and view your environment in Azure Time Series Insights. To learn how to create an event hub, see the Event Hubs documentation. In the search box, search for Event Hubs. In the returned list, select Event Hubs. When you create an event hub, you are really creating an event hub namespace. If you haven't yet created an event hub within the namespace, in the menu, under Entities, create an event hub. After you create an event hub, select it in the list of event hubs. In the menu, under Entities, select Event Hubs. Select the name of the event hub to configure it. Under Entities, select Consumer groups, and then select Consumer Group. Make sure you create a consumer group that is used exclusively by your Time Series Insights event source. Make sure this consumer group isn't used by any other service (such as an Azure Stream Analytics job or another Time Series Insights environment). If the consumer group is used by the other services, read operations are negatively affected both for this environment and for other services. If you use $Default as the consumer group, other readers might potentially reuse your consumer group. In the menu, under Settings, select Shared access policies, and then select Add. 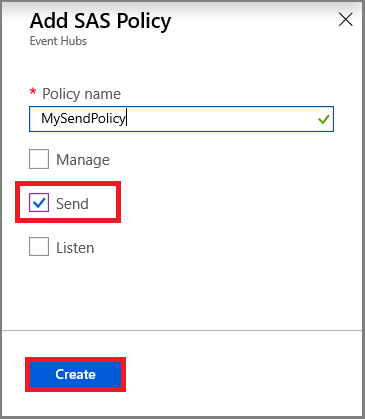 In the Add new shared access policy pane, create a shared access named MySendPolicy. You'll use this shared access policy to send events in the C# examples later in this article. Under Claim, select the Send checkbox. The Time Series Insights update uses instances to add contextual data to incoming telemetry data. The data is joined at query time by using a Time Series ID. The Time Series ID for the sample windmills project that we use later in this article is Id. To learn more about Time Series Insight instances and Time Series ID, see Time Series Models. If you haven't created an event source, complete the steps to create an event source. Set a value for timeSeriesId. To learn more about Time Series ID, see Time Series Models. In the search bar, search for Event Hubs. In the returned list, select Event Hubs. Go to Shared Access Policies > RootManageSharedAccessKey. Copy the value for Connection sting-primary key. Go to https://tsiclientsample.azurewebsites.net/windFarmGen.html. The URL runs simulated windmill devices. In the Event Hub Connection String box on the webpage, paste the connection string that you copied in Push events. Select Click to start. The simulator generates instance JSON that you can use directly. A JSON array with two JSON objects. Each JSON object is converted to an event. The property location is copied over to each event. A JSON object with a nested JSON array that contains two JSON objects. This input demonstrates that global properties can be represented by the complex JSON object. View your environment in the Time Series Insights explorer.